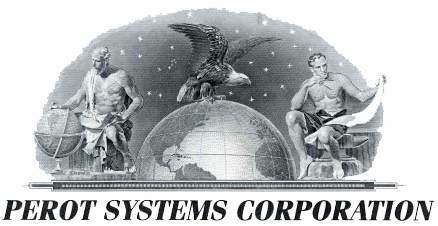 Beautifully engraved certificate from the Perot Systems Corporation. This historic document was printed by the American Banknote Company and has an ornate border around it with a vignette of allegorical men with a globe and an eagle and the compnay logo. This item has the printed signatures of the Company’s Chairman, President & Chief Executive Officer ( Ross Perot ) and Secretary. Perot Systems is a worldwide provider of information technology services and business solutions to a broad range of clients. They serve clients by delivering services and solutions focused on each client's specific needs, with particular emphasis on developing and integrating information systems, operating and improving technology and business processes, and helping clients transform their business. Perot Systems helps large multinational companies leverage their traditional strengths and technologies to take full advantage of e-business by capitalizing on the growth and productivity that can be achieved by integrating many companies into common marketplaces. With more than 7,500 employees and more than one billion dollars in revenue, Perot Systems has relationships with clients in the financial services, healthcare, energy, travel and transportation, communications and media, insurance, and manufacturing industries. 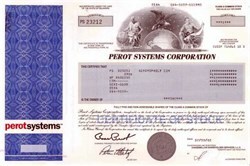 Ross Perot founded Perot Systems in June 1988 and served as director, president, and chief executive officer of Perot Systems from November 1997 to August 2000. He currently serves as chairman of the Board of Directors. From April 1988 to June 1992, Mr. Perot held the position of chairman of the company, and continued to serve as a director until August 1994. Mr. Perot has been a private investor since June 1992. Please note that if you buy a modern certificate from a discount or full service broker, it can cost you between $55 to $100 and that doesn't even include the cost of the stock. You will be charged for a commission and certificate issuance fee. Furthermore, if the company has been delisted and no longer traded, you will unable to get the certificate. Also, the modern certificates we offer have not been folded in thirds which is usually done if you order them directly from a broker. Lastly, the certificates are not issued in your name so if you frame the certificate and/or subsequently resell it as a collectible, the certificate won't have your personal information printed on its face. We do not require you to buy a frame from us for your certificate as it is optional.